ASA has partnered with NAHB and NKBA as a supporting organization for the second annual Design & Construction Week™ featuring the co-location of the International Builders' Show and the Kitchen & Bath Industry Show. As a member of ASA, you'll be able to register for the 2015 IBS and/or the 2015 KBIS for a special discounted registration fee that is only being offered to members of supporting organizations. Design & Construction Week™ is taking place in Las Vegas, January 18-23. For more information and to receive your special discount, click here for – REGISTRATION DETAILS. This week, nearly 70 business groups, including ASA, wrote to the Department of Labor regarding our concerns over changes to reporting requirements for injuries and illnesses in the workplace. The Coalition for Workplace Safety is comprised of associations and employers who believe in improving workplace safety through cooperation, assistance, transparency, clarity and accountability. OSHA is proposing to update the requirements pertaining to the number of employees that are hospitalized and the amount of time an employer has to notify OSHA, both becoming increasingly burdensome on the employer. How Well Are Your Employees Trained on Sump, Sewage and Effluent Pumps? The Midwest Distributors Association will host its 2014 Annual Meeting & Dinner on Nov. 3 at Ditka's Restaurant in Oak Brook Terrace, Illinois. Matthew Carmichael, author of the book, "BUYographics," and the editor and vice president of Livability.com, has accepted our invitation to share his research and findings about how demographic and economic changes will reinvent the ways marketers reach customers. All MwDA members as well as channel partners from throughout the Midwest are strongly encouraged to participate. Click here for complete details; the deadline to RSVP is Oct. 27. "ASA has helped me connect with other female professionals within the PHCP and PVF industry. It gave me a chance to reconnect with Katie Poehling, which has led to the forming of ASA's Women In Industry Division. ASA continues to help me form relationships that I would not have otherwise." – Ashley Martin, NIBCO Inc. 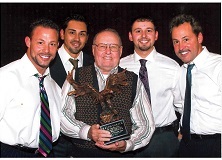 In Memoriam: Ralph Porter, Sr., Founder of Porter Pipe & Supply Co.
Ralph Porter, Sr., receiving the lifetime achievement award from Porter Pipe. L-R, Ralph "Bud" Porter, Jr., Nick Porter, Ralph Porter, Sr., Frank Porter, Jim Porter. It is with deep regret that ASA announces Ralph Porter, Sr., passed away Oct. 12. In 1976, at the age of 50 and with eight children in Catholic school, he founded Porter Supply Company in Addison, Illinois, with two employees, himself and son, Jim Porter, who is the current president. Today, the company is known as Porter Pipe & Supply now employs 130 people and continues to grow. Affectionately known by his employees as "Mr. P.," he was always full of passion for life, his family and his life's work. For more information, click here. The value of failure has become a mantra in Silicon Valley, with the rise of events like FailCon, a conference "for startup founders to study their own and others’ failures and prepare for success." Failure, the thinking goes, is an intense form of hands-on education that — when done right — enables you to learn quickly and grow. Despite the startup world's enthusiasm, however, there's often a lingering stigma: it's less that you've tried and failed, and more that you are "a failure." The Industrial Careers Pathway, a multifaceted North American workforce initiative supported by an alliance of industry associations, has welcomed the National Association of Chemical Distributors as ICP's seventh Alliance Partner. NACD joins the American Supply Association, the Industrial Supply Association Education Foundation, the National Association of Electrical Distributors, NAHAD–the Association for Hose and Accessories Distribution, NIBA-The Belting Association and the PTDA Foundation in taking coordinated action to secure a skilled industrial workforce for today and tomorrow. Affiliated Distributors, the largest industrial and construction products buying and marketing group in North America, Industrial Supply Division hosted their largest North American Meeting in the history of the Division: 712 attendees, representing 131 AD Member companies, 134 Supplier Partner companies and two countries, Sept. 22–24, at the Gaylord Palms, in Kissimmee, Florida.